The new methods aim to train the ear, the tongue and the eye. The author has tried to bring together a set of exercises giving to each of these organs a fair field of activity. He uses the conversational method from the very start. Created by language experts from the U.S. Foreign Service Institute, these comprehensive courses are designed to take the learner to mastery of a foreign language at an accelerated rate. Audio support is available for this course. The book will teach you pronunciation and phrases, pronouns, the present indicative, irregularly-conjugated verbs, the passe compose, and several more tenses and complex grammar rules. 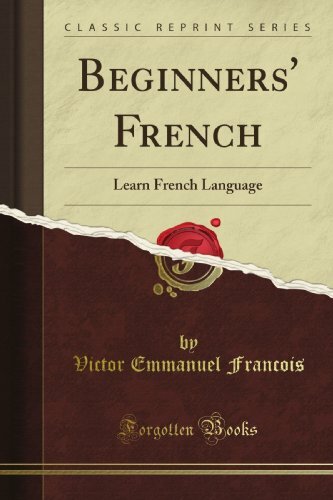 The fourth level focuses on French literature and prose writing. In this edition I have endeavoured to keep down additions as much as possible, so as not to overload the book; but I have not been sparing in adding cross-references (especially in the Index) and quotations from standard authors.